The habit of bruxism or nighttime teeth grinding is a common result of anxiety and stress. If you clench or grind your teeth thousands of times while you sleep, the immense pressure you place on your jaw can wear down your teeth and even cause joint and muscle problems. Teeth grinding may also occur when you are awake; you may not even be aware that you are doing it. About one in three people grinds their teeth, and many will suffer tooth decay, sensitive teeth, and temporomandibular joint (TMJ) problems as a result. 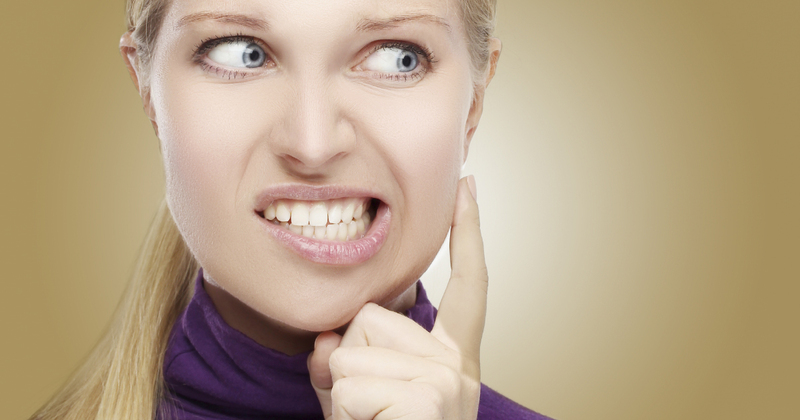 Stressful situations tend to make bruxism worse. In fact, the behavior may begin after a trauma such as a car accident or sudden loss. It’s easy to understand why clenching your jaw or teeth is a natural reaction to stress; a nerve in your jaw leads directly to the part of your brain that controls the fight-or-flight response. Anxiety and tooth grinding can become a vicious cycle. When you grind your teeth at night, it frequently awakens your brain from deep sleep, and the lack of proper sleep exacerbates anxiety problems. Increased anxiety leads to more tooth grinding. Treatments such as medications, therapy, and dental devices like mouth guards are available to improve symptoms of TMJ syndrome and protect your teeth. Consult your dentist for advice.